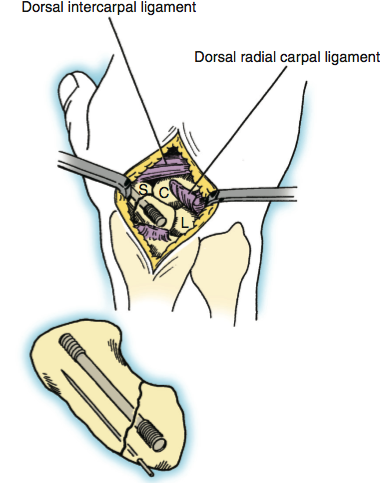 Scaphoid Fractures and Non-Unions Handout | Dr. Thomas Trumble, M.D. 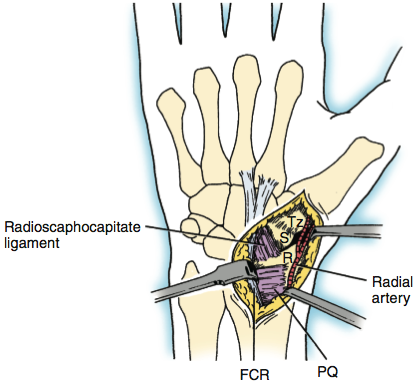 The scaphoid is one of the key bones in the wrist that control wrist motion and is the most commonly fractured (Figures 1 and 2). The symptoms can often be quite vague after a fall on an outstretched hand. There is typically some mild swelling along the radial side of the wrist and decreased strength because the fracture occurs within the wrist joint itself. The pain is not as severe as most fractures, and scaphoid fractures are often misdiagnosed. The scaphoid is a very special bone and it is named after the Greek word for a boat, in reality the bone looks more like a peanut than a boat. 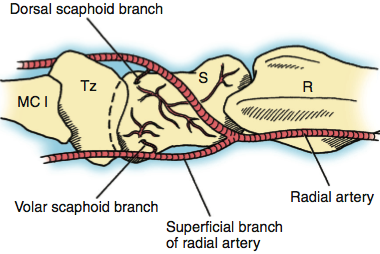 The scaphoid has a special blood supply that enters in only a few locations and then travels to the distal closest, the fingertips, the proximal close, and then to the heart (rather than the opposite direction). 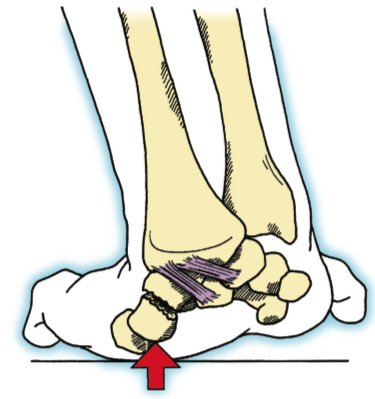 This makes the fractures very prone to ischemia due to loss of blood supply (Figure 3). 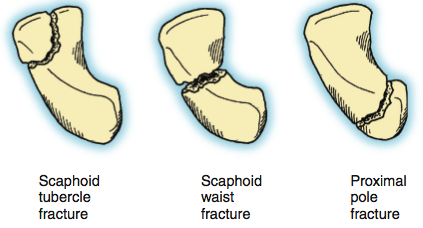 The three main patterns of scaphoid fractures include: scaphoid tubercle fractures: fairly minor injuries and can heal in a cast, scaphoid waist fractures: frequently requires surgery if there is any displacement, and proximal pole fractures: require surgery because the blood supply is so severely diminished that any delay in healing can result in necrosis or death of the bone referred to as avascular necrosis due to loss of the blood supply and early arthritis. Although these can occur in any individual after a fall, they are much more common in young patients, particularly males. This is a common injury in sports where high energy falls or collisions occur. 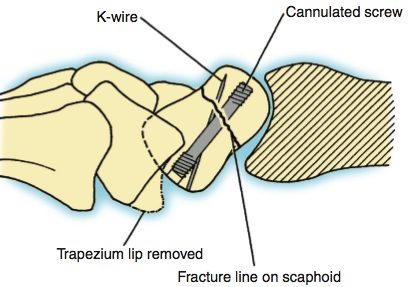 How do we diagnose Scaphoid Fractures? 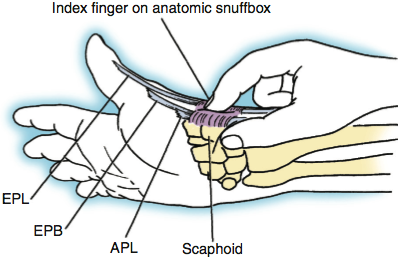 A key feature is tenderness at the base of the thumb referred to as the anatomic snuffbox (Figure 4). The area is bordered by tendons, creating a rectangular space that was referred to as the snuffbox in colonial times. This is where snuff was placed prior to sniffing it. 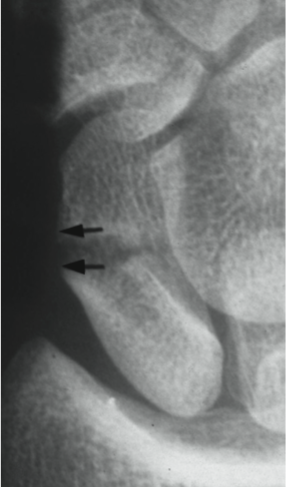 X-rays can be very helpful, but often the initial x-rays miss the scaphoid fractures (Figure 5 and 6). MRIs are very helpful in diagnosing not only acute fractures, but also determining if chronic fractures referred to as non unions have lost their blood supply, which creates a dark space on the MRI image. 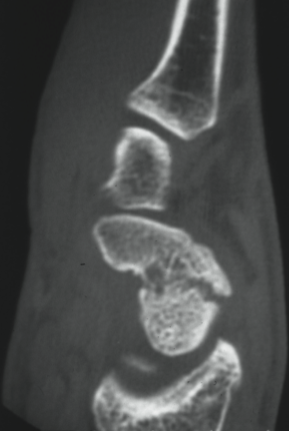 Computerized tomography (CT) scans are helpful to determine if there has been a collapse, a displacement, or a fragmentation around the fracture.